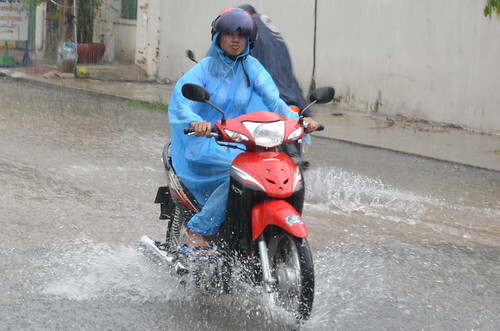 If there is an argument that cities have speeds from which they should be viewed – if New York should be seen by foot, Los Angeles by car, Copenhagen by bike – then Phnom Penh should be seen by moto. The speed and scale of a moto make sense here – this isn’t a city of walkers and cars isolate you from the noise, the heat, the sounds and the smells so inherent to the experience of traveling the city. 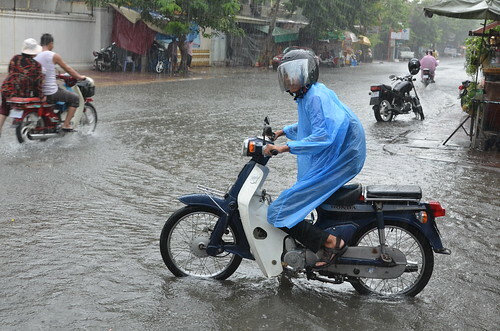 So here is Phnom Penh via Honda Super Cub. I drove for about 2 hours and the camera was set to take 1 photo per second – about 7,200 stills. I cut some of them into quick videos. After the Our City Festival and Urban Lab Phnom Penh wrap up I’ll try to put together the route map and maybe something a little more coherent and less spastic. 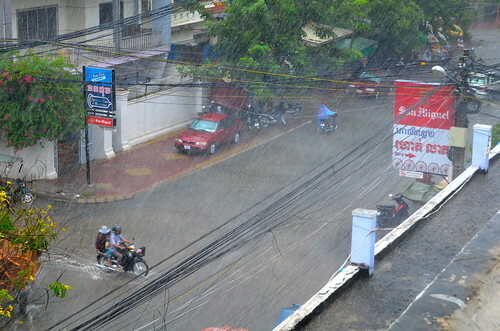 I was really hoping for some rain and flooding footage but the rain gods are uncooperative. Nevertheless it was good fun. 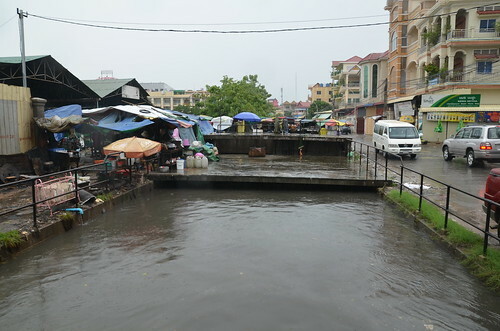 Length of the sewage canal north to south. Canal Street 105 from Shelby Doyle on Vimeo. 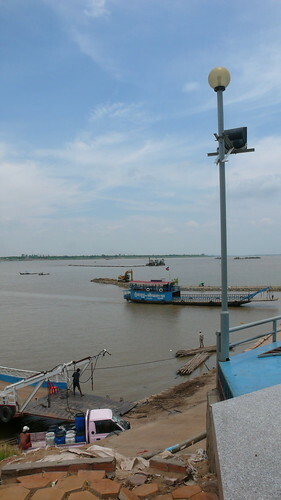 From Phnom Penh to Takmao on National Highway 1. 100 meters to my left is the Basaac River and 100 meters to my right several thousand hectares of wetlands. Notice you can see neither and everything in sight is paved. 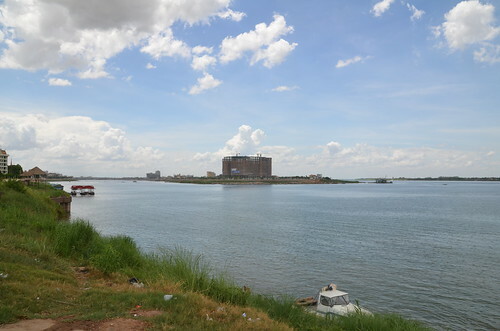 This is the site for the studio I’m teaching this semester Projecting Phnom Penh –Description. 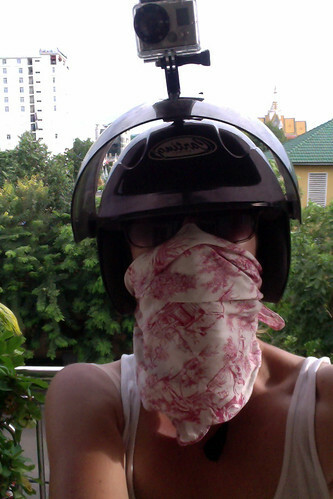 Phnom Penh ToTa Khmao from Shelby Doyle on Vimeo. Some shots slowed down and spliced together. Random from Shelby Doyle on Vimeo. And here is the entire 2 hours compressed into 10 minutes – a little manic. 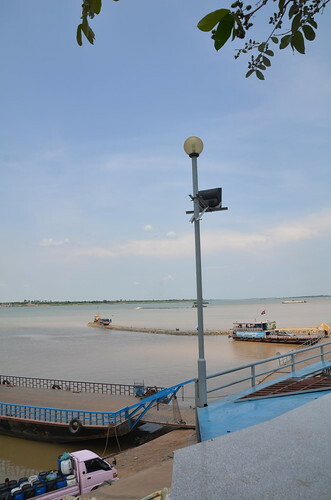 6PM: Our mental time lapse film of the Mekong River in which a flurry of activity flutters and buzzes around the unfettered hydraulic pulse of the river is now irrevocably being altered. 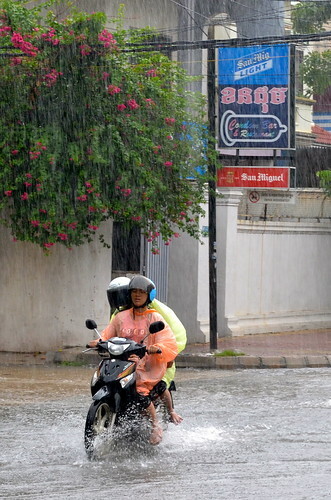 One word that does not come to mind when we think of the “mighty” Mekong is vulnerable, and yet that is precisely what it has become. R. Scott Davis’ OF RIVERS AND MANTRAS: THE MEKONG SYSTEM explores the complex relationships between the river, its ecosystems, and people whose survival depends upon it. 8PM: Screening of the documentaries MEKONG THE MOTHER (2000, 60 mins, Engl.) by P. Degen and WHERE HAVE ALL THE FISH GONE (2012, 30 mins, Engl.) by T. Fawthrop. “Of Rivers and Mantras: the Mekong System” is a five year project by photographer R. Scott Davis that explores the complex relationships that exist between the Mekong River, its surrounding ecosystems, and the populations of people whose survival depends directly upon it. 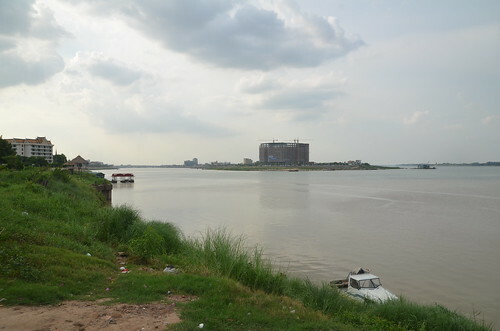 The Mekong River, one of the world’s epic rivers such as the Amazon, the Ganges, and the Nile, has been providing sublime nourishment for survival to millions of people for thousands of years. 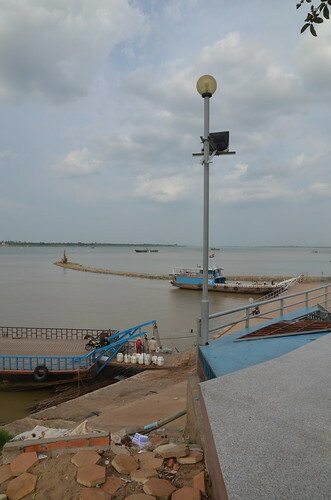 Our mental time-lapse film of the Mekong River in which a flurry of lifeblood activity buzzes around the unfettered metronomesque pulse of the river is now irrevocably being altered. 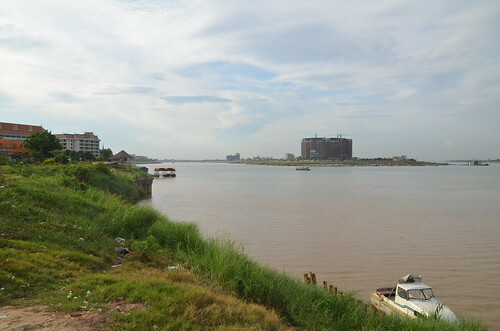 One word that does not come to mind when we think of the “mighty” Mekong River is vulnerable, and yet that is precisely what it has become. 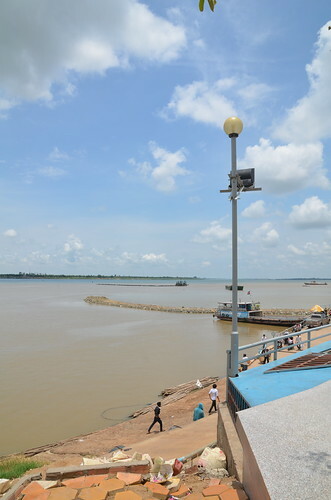 Data reflecting the effects of climate change and the continual building of hydroelectric dams on the hydrology of the Mekong River and the surrounding ecosystems can often be complex and subject to various interpretations. For this reason one of the main focuses of “Of Rivers and Mantras” is to attach a human face to those whose methods of survival are intrinsically connected to the Mekong River and are therefore directly impacted by these abstract sets of data in very real ways. The series begins with the “My Tho Panoramic, Mekong Delta, Vietnam”, a panoramic image that is monumental in scale (twelve feet long) and utilizes a micro / macro relationship that captures both the daily activities of My Tho’s denizens in an intimate manner while evoking the sweeping force of the river as it surges through My Tho. 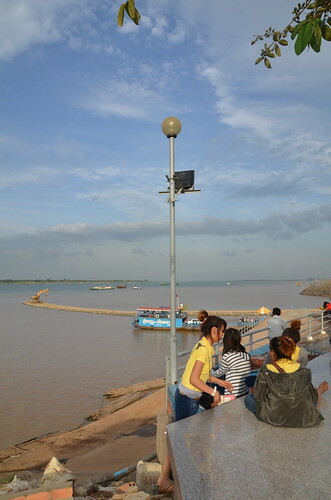 Other images in the series such as the “Fisherwoman, Vientiane” and “Pan, Phnom Penh” are portraits, perhaps figurative portraits would be a better description, capturing daily life along the Mekong River, in this case, in Laos and Cambodia respectively. The series concludes with a diptych of panoramics shot in Vientiane, Laos. 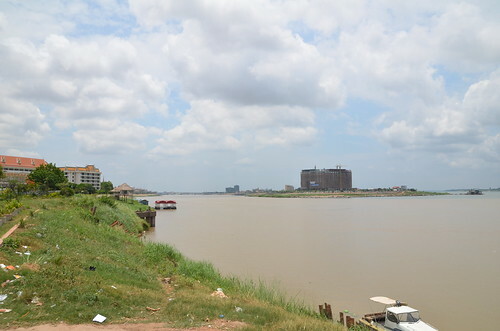 These two images were shot from the exact same vantage point months apart at two distinctively different times of the year, the first one during the rainy season, when the level of the river is naturally at its highest, and the second one in the dry season when the level of the river is at its lowest. 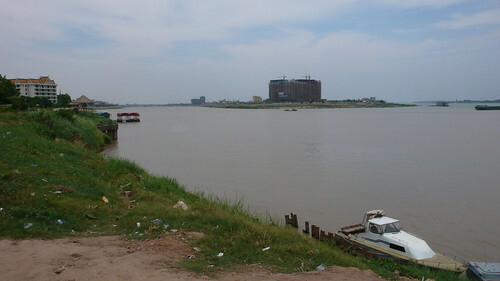 When juxtaposed, the lines of the horizon are identical in both images while the fluctuations in the water levels of the river are vastly different. The “Of Rivers and Mantras: the Mekong System” was shot using large and medium format film cameras, the film then custom processed and drum-scanned by the photographer himself in order to ensure that the very specific analog tonal values the photographer desired were achieved. Ok, it needs some work but its a start. Here are the first 15 weeks. Time Lapse Test from Shelby Doyle on Vimeo. 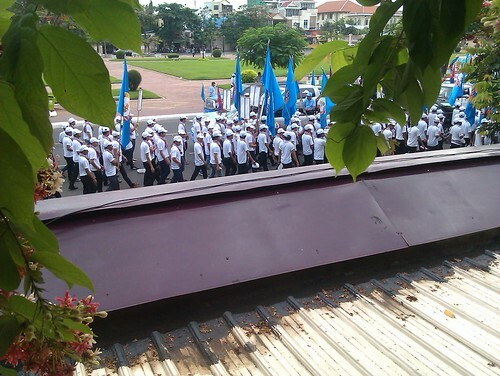 Olympic Stadium Phnom Penh from Shelby Doyle on Vimeo. Tonight, I’m going to share with you the story of the construction of the Olympic Stadium here in Phnom Penh, show some photos of how it looks today and show why I think its worthy of Nerdiness. If you have NOT been to the Stadium then the goal of this presentation is to convince you to go see it. If you have been then hopefully this will only renew your appreciation for its awesomeness. 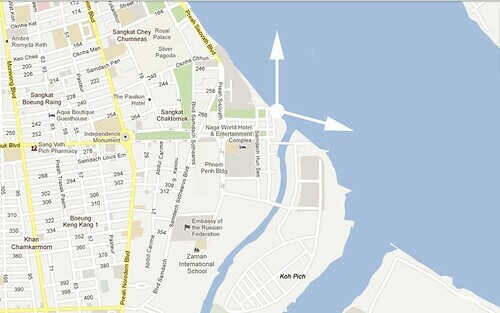 As most of your probably already know the Olympic Stadium is located north of Sihanouk Boulevard. However, less well known is that the Stadium was built as part of a larger master plan – including housing for an Olympic Village and a Water Sports + Yacht Club – both located near the riverfront. The now demolished Water Sports Complex was once a boat and waterskiing club, it was home to several piers, a bar and a restaurant. 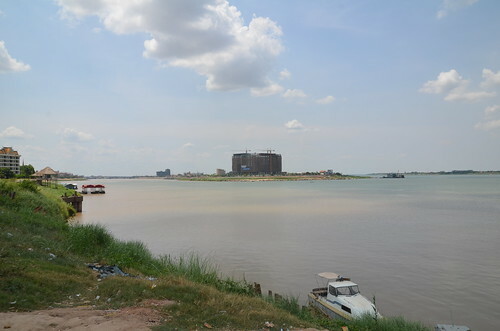 The Olympic Village contained athlete housing and was once home to the National Theater – since demolished, The Gray Building – now the Phnom Penh Center and The White Building – which remains although almost unrecognizable – at the end of Street 294. Construction of the Stadium was commissioned by Norodom Sihanouk and began in 1962. 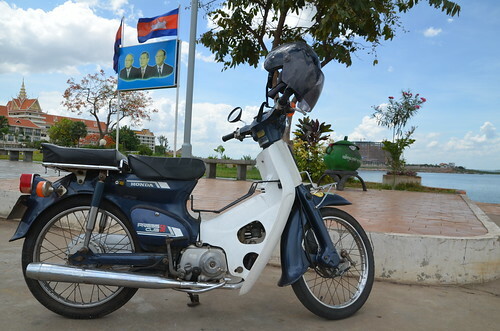 Cambodia was scheduled to hold the 1963 Southeast Asian Games. However, Jakarta stole Phnom Penh’s moment of glory by hosting a non-aligned version of the Olympics known as the World Games of the New Emerging Forces. The stadium designed by Cambodian architect Vann Molyvann – shown here and assisted by UN engineer Vladimir Bodiansky, UN urbanist Gérald Hanning, and a team of Cambodian, French and Soviet architects and engineers. Teams here in Cambodia and in France worked on many of the construction drawings. The design team’s concept was to create a building at the intersection of water and earth. Here are some of the original sketches comparing the stadium to Angkor Wat – the design was built in a style known as New Khmer Architecture which combines modernist design principles with Khmer architecture elements. The site plan is organized along cardinal axes. One sixth of the original site plan was devoted to reservoirs and water treatment – everything shown here in blue. The stadium seating is carved from a man made grassy hill constructed of 500,000 cubic meters of earth. The site chosen was then a wetland and the ground so damp that initially oxcarts were used to move excavated earth. The first bulldozer used on the site, gradually began to sink – when the driver realized what was happening he hopped out – and the bulldozer – disappeared completely beneath the mud. It is likely still there today. I’ll buy you a beer if you find it. The complex was completed in an astonishing 16 months. Outdoor Stadium could seat 70,000 people. The Indoor Stadium seated another 8,000. The swimming and diving pools seated 4,000. There were also eight tennis courts and 16 volleyball and basketball courts. 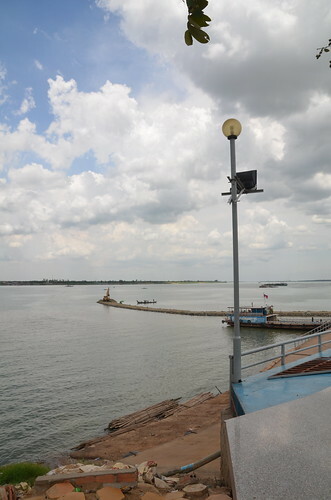 You can see Boueng Kak Lake in the background. So present day. Here are some reasons why I think the stadium is still amazing… the entire thing is built into a man made hill and – the seating, which was made of precast pieces -incrementally installed to stabilize the earth below and direct water into a trough surrounding the track – once a part of an intricately calibrated waterworks. To the west side of the stadium is VIP seating – shaded by the same roof that extends to cover the indoor stadium. You can see it here with the white concrete boxes. Adjacent to the seating is the press box – you can see it here to the left of the roof. Structurally it does a few interesting things. The first is that it cantilevers off a single beam – which is integrated with both a set of stairs and I don’t know if you can see but on either side is a water channel for drainage. The design allows for two things – one unobstructed views for the press and two the small structural footprint means that only a few spectator seats are lost to the press box. The indoor stadium is designed as a box resting on the sets of surrounding stairs which are designed as the actual structural support of the courts and seating inside. Below is a network of water collection pools. The interior is accessed by passing over the water through a series of pedestrian bridges which also form a sort of indoor track loop. Inside the court is a naturally ventilated – keeping the courts cool – and light is filtered through a series of intricate concrete screens. Although it makes for tough afternoon playing conditions on the court but I think its still one of the most photogenic spots in the city. Opposite and on axis to the east are a trio of umbrella canopies – which shade the pool seating below – they span 34 meters from two center columns – impressive engineering even by todays standards and taper to an almost impossible thinnes – and if you look closely the trace of the original wooden formwork for the concrete can still be seen on the underside of the canopies. Invisible from the stadium rim the swimming and diving pools are tucked behind the food vendors and on the other side of a wall – the pools are accessed by descending the seating.The complex contains a regulation swimming pool – 8 – 50 meter lanes and a 1, 3, 5 and 10 meter diving board – and apparently once also hosted water polo matches. So if the architecture isn’t selling you then maybe the hundreds of sports you can play at the stadium will – many for free or a small fee – everything from tae kwon do, to gymnastics, to soccer, to badminton, to petanque, to some amazing volleyball and if those aren’t your speed then there is always sunset jazzercise. And if sports aren’t your thing – then maybe music will convince you – the stadium is still the largest outdoor music venue in the city recently hosting December’s MTV Exit Anti-Trafficking concert. Who can argue with 40,000 screaming teenagers? So that’s all I have. I find the stadium a reminder of the creative potential here in Phnom Penh and it remains one of the best outdoor spaces and buildings in the city. Here is a shot of my favorite detail at the stadium – you’ll have to email me and let me know if you find it. Thank you. Unfortunately (or fortunately?) 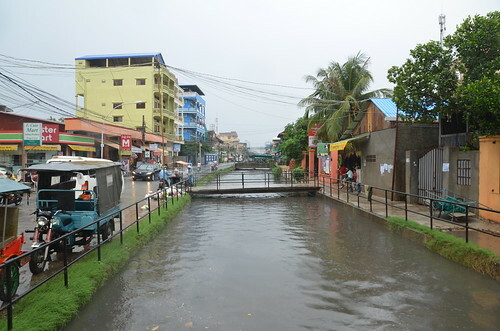 I just missed the canal cresting onto the street. But here it is still quite high and moving quickly. 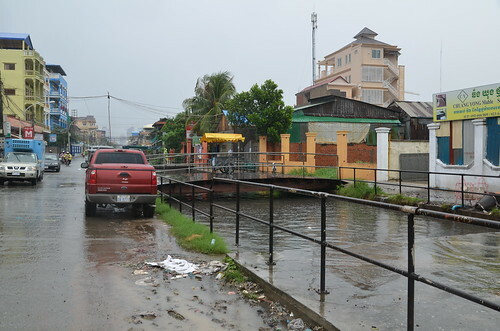 If you are caught in the stormwater around the sewage canal make sure you wash up. ■ rarely, allergic alveolitis (inflammation of the lung) with fever, breathlessness, dry cough, and aching muscles and joints. All donations are tax deductible thanks to our fiscal sponor, From the Heart Productions! Sueno Relief was founded on the belief that every voice should be heard. We are producing this documentary in order to capture a critical time in Cambodian history, focusing on current issues that impact this vulnerable community. Through telling these powerful stories, we ensure that these resilient voices do not continue to go unnoticed. “Resilient Cambodia” will tell the moving stories of 5 artists struggling in the wake of a tragic legacy of genocide, a current clean water crisis, and the growing tide of international influence. Art is vital to any culture, especially one such as Cambodia where art is not just a result of creative fancy, but a clear indicator of its overall health and wellbeing. These artists are living symbols of their community’s heart and history, and carry their culture’s history and identity in their practice. This film will examine the struggles of these vital but overlooked individuals, while upholding sustainable, locally-empowering organizations and responsible tourism as a road towards a bettered community. Many know that during the Khmer Rouge’s four year reign of terror in the late 70’s, nearly 2 million Cambodians were killed (1/3 of their population). Most, however, are not aware that 90% of Khmer artists and intellectuals, who had been in the midst of a golden age, were targeted and killed. In the 30 years since, political infighting and severe poverty threaten to keep this beautiful and ancient culture silent forever. Recently the country has begun to rebuild, but progress has been slowed by a clean water crises that rivals the worst in the world and is compounded by the rush of international tourism that threatens to homogenizewhat used to be called “the Pearl of Asia”. By supporting this film, you will be giving a voice to the unheard in this world. You can help an entire culture stand stronger and provide hope for the future. Through telling the stories of traditional and cutting edge Cambodian artists, we are examining the health of a culture at a critical time . With your help, we can make these important voices heard throughout the world. Two team members are flying to Cambodia from the US and are in the hiring process for two more, possibly local Cambodians, to make up the rest of the crew. The shoot will last five weeks, from October 27 to November 29, just in time for the Water Festival in the capital, Phnom Penh. 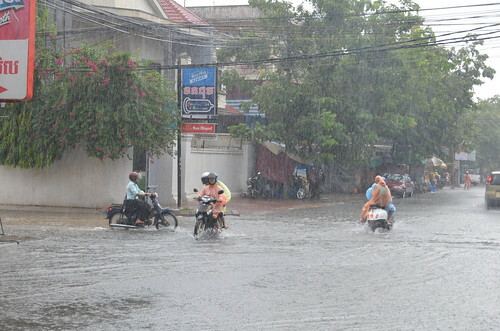 From there, we will travel to the Sihanoukville province (beachy tourist attraction), then to the outskirts of the province of Siem Reap (very rural). 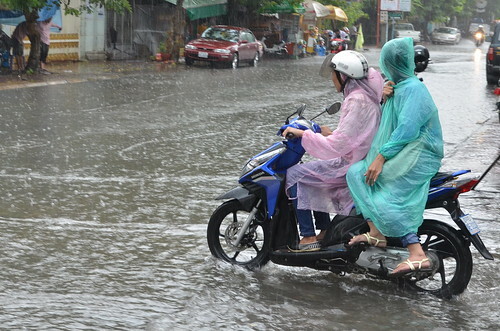 To make “Resilient Cambodia” a reality, we need $19,000! This is an adventurously small budget, but we are confident we can do this without sacrificing quality story telling. Please take a look at the magnificent perks we offer as a thank you for donating. We really want to give them to you in exchange for your generosity!! We’d like to take this time to add that we are not paying ourselves in any part of this budget! Because we feel very strongly that these stories need to be told, we are going unpaid unless a miracle happens (we like miracles). Each penny raised through your generous donations will go directly toward the making of this this documentary. And, remember, all donations to this project are tax deductible. To provide irrefutable data alongside the poignant anecdotes told by our subjects, a recurring water theme will be used as an indicator of the country’s health and wellbeing. For each artist we follow, we will use professional water analysis to determine the contaminant(s) of their individual water sources, and study the effects of each. In this way we provide irrefutable numbers that back up the visual circumstances. “Resilient Cambodia” will advocate responsible tourism and sustainable charities as a solution that viewers can be a part of through action or other support. We have been in contact with and will highlight some incredible organizations who support and bolster local communities including Let Us Create, Journeys Within our Community, Anjali House, Meta House and more. Your donation is needed to make this project a reality and to facilitate the telling of these unique stories. In addition to your financial support, we need your help spreading the word. If you’ve read this far, you care. So take it one more step and post on Facebook, Twitter, your blog, and email every single person you’ve ever met! Thank you and please stay tuned for updates! Unfortunately all I had with me is my terrible HTC camera. But I think the general creepiness of this still comes across quite clearly. 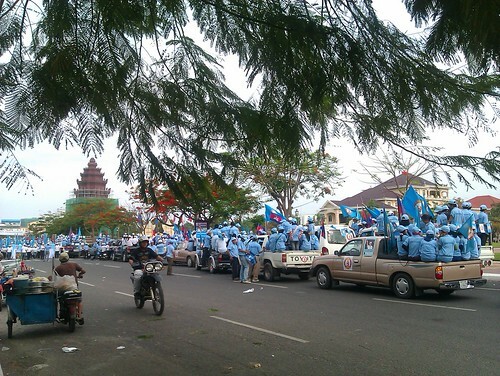 In the background: Hun Sen’s house and Independence Monument. Traffic was stopped all day. What is the CPP? 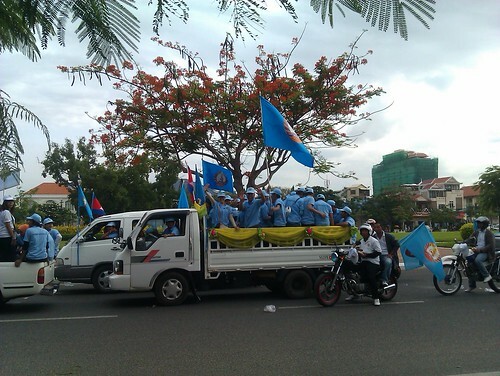 Also, check out Philip Skoczkowski’s photos of the Sam Rainsy party campaigning.